Still, it’s fatiguing being funny every day, and Rineman isn’t sure how long he can keep writing one-liners. Perhaps with an eye toward life after “The Tonight Show,” he’s been honing his stand-up routine, making three or four club appearances a week after wrapping up work at 30 Rock. He is performing three shows at Laugh Boston July 9-11. On a recent weeknight, after watching the 5 p.m. taping of “The Tonight Show” and meeting with the other writers, Rineman sat alone in his office for two hours working on jokes. He then grabbed his backpack and headed to The Stand, a tiny comedy club on Third Avenue, where he ran through five minutes of material. 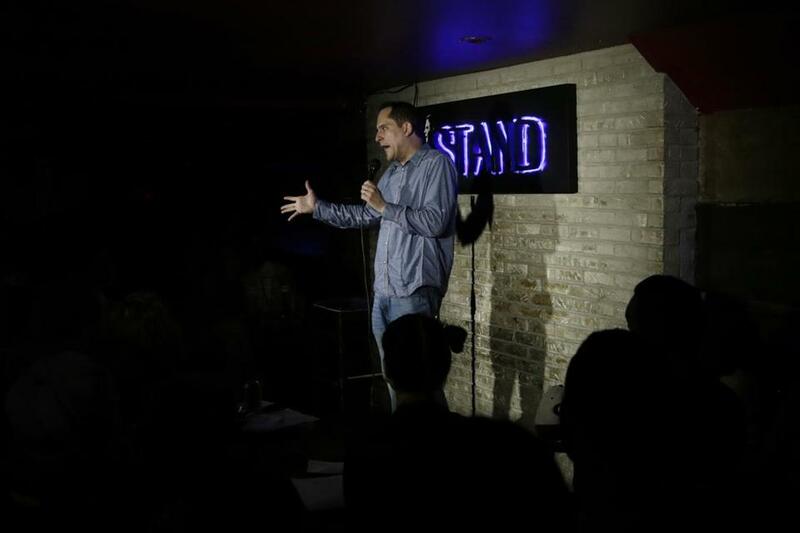 He quickly got back on the subway, and arrived at the Greenwich Village Comedy Club in time for a 15-minute headlining set at 11 p.m.
School is where he first discovered his penchant for punch lines. The son of an airline pilot and a journalist, Rineman grew up in North Hampton, N.H. He was a decent student, but found it easier to remember historical events if he added a joke. (“You know, like, ‘Then they all went to Applebee’s.’ ”) He was also a talented athlete, but a diagnosis of rheumatoid arthritis, a painful condition that caused his joints to swell, steered him toward comedy. But comedy is a competitive business, as he learned at Emerson. It turned out he wasn’t the only kid who did Jay Leno impressions, could recite whole scenes of “Seinfeld,” and stayed up late deconstructing the monologues of David Letterman and Conan O’Brien. 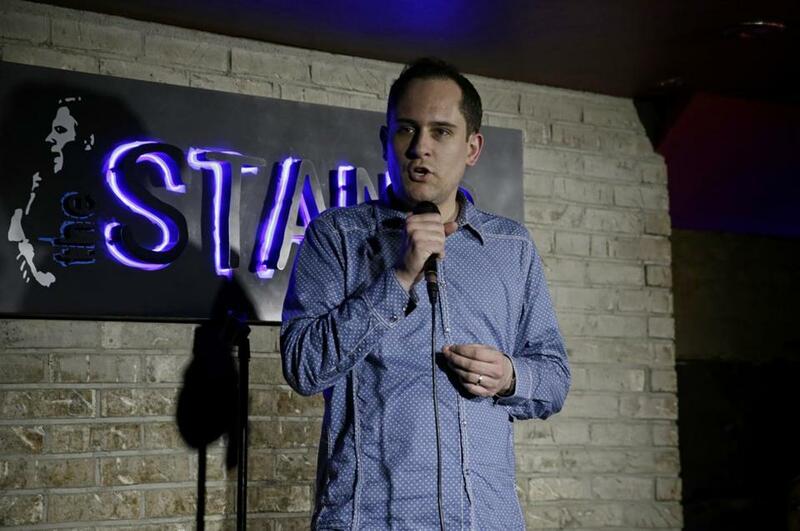 While in college, Rineman mustered the courage to try stand-up at The Comedy Studio in Harvard Square. It didn’t go well. Rineman’s break came after graduation when a family friend who grew up with Jay Leno in Andover agreed to pass along his material. That was on a Saturday. The following Monday night, Leno called Rineman at his parents’ house and invited him to join a group of freelancers who faxed jokes to “The Tonight Show,” with no promise that their stuff would be used. But Rineman’s frequently was, and the arrangement, which paid a paltry $75 for each joke used in Leno’s monologue, lasted for four years. Rineman also faxed bits to “Saturday Night Live” for the “Weekend Update” segment, hosted then by Seth Meyers, and to “Late Night With Jimmy Fallon.” Eventually the “Late Night” writers, impressed with the number of jokes Rineman generated on a daily basis, summoned him to New York to interview for a job. He was 26 and living at home with his parents. Rineman couldn’t quite believe he got the job. “I think their big reason was, like, if we don’t hire this guy, who will?” he says, only half joking. It was daunting to join a staff that included established comics like Federman, Jeselnik, Morgan Murphy, and Jeremy Bronson.“I didn’t want to get on the elevator,” he says. “I was, like, this isn’t going to work. They’re going to find me out. But I got off to a fast start and everyone was so nice to me. “My life was saved by those people,” he adds quietly. It’s after midnight and Rineman is standing on the platform at the West 4th Street subway station, looking at his phone. He was pleased with the crowd’s response in the clubs. But he isn’t smiling. ”Stand-up is the sport I get to play after school. There’s a big difference between what’s funny on TV and what’s funny in a club.” said Jon Rineman on writing jokes for “The Tonight Show” and performing them in a stand-up set.